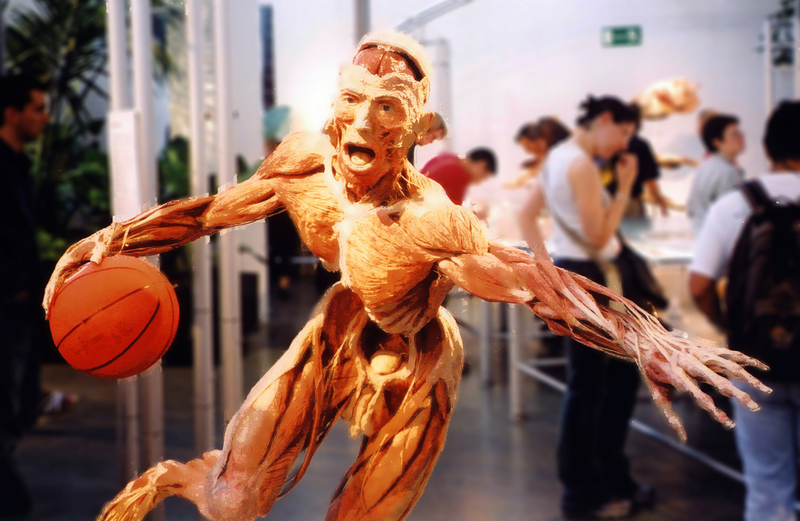 Reconsidering Body Worlds: why do we still flock to exhibits of dead human beings? Frozen in place, plastinated remains in the exhibits are rigidly posed – both for dramatic effect and to illustrate specific bodily features. Over 40 million museum visitors have encountered these exhibitions in more than 100 different locations worldwide. Even copycat exhibits have taken off, eschewing accredited museums in favor of places like the Luxor Hotel and Casino in Las Vegas. But Body Worlds – though seemingly an entirely modern phenomenon only made possible with futuristic plastic technology – emerges from a long tradition of popular exhibits featuring actual and simulated human remains. What continues to draw so many people to human body exhibitions – even today? For nearly as long as physicians and anatomists have attempted to understand the body, they have attempted to preserve, illustrate and present it. Cabinets of curiosities displayed in the homes of European nobility in the 16th century frequently included human skulls. As civic museums emerged in cities throughout Europe and the United States, some began to formally organize collections around anatomical questions. Medical museums were often more interested in pathologies – abnormal medical conditions or disease. They also collected thousands of skulls and bones, attempting to address basic questions about race. Early on, medical museums were generally closed to the public, instead focusing on training medical students through hands-on experience with specimens. Almost reluctantly, they began opening their doors to the public. Once they did, they were surprised by the relatively large number of visitors curiously entering their galleries. Medical museums were not the sole institutions housing and displaying remains, however. Collections aimed more squarely at the general public often included such items as well. The Army Medical Museum, for instance, located along the National Mall, exhibited human remains between 1887 and the 1960s (living on as the National Museum of Health and Medicine). The Smithsonian’s National Museum of Natural History built its own large body collections, especially during the early 20th century. Popular exhibits at the American Museum of Natural History exhibited human remains in New York City just steps from Central Park. Notable exhibits featuring human remains or innovative reproductions were also wildly popular at World’s Fairs, including Chicago (1893), St. Louis (1904) and San Diego (1915), among many others. People crowded galleries even as these exhibits proved vexing to critics. In the quest to rapidly build collections, remains were sometimes collected under highly questionable ethical circumstances. Bodies were removed from graves and sold, gathered from hospitals near exhibitions reminiscent of human zoos, and rounded up haphazardly from battlefields. In the United States, the human body in the late 19th and early 20th century was racialized in almost every respect imaginable. Many people became obsessed with the supposed differentiations between Native Americans, African Americans and European Americans – occasionally stretching claims into rigid hierarchies of humankind. The exhibitions dehumanized bodies by casting them as observable data points rather than actual human beings. Some exhibits blended medical science and racial science in a bizarrely inaccurate manner. Medical doctors supported eugenics groups organizing temporary exhibits comparing hair and skulls from different apes and nonwhite humans, underscoring popular notions about the supposedly primitive nature of those outside of Western civilization. To our modern eyes, these attempts are obviously stained by scientific racism. Eventually, the racialized science that had led to collecting thousands of skulls and other bones from people around the world came under increased scrutiny. The comparative study of race – dominating many early displays of human remains – was largely discredited. Indigenous activists, tired of seeing their ancestors viewed as “specimens,” also began pushing back against their display. Some exhibit planners began seeking other methods – including more sophisticated models – and exhibiting actual human remains became less prominent. By midcentury it was less common to display actual human remains in museum exhibits. The occasional Egyptian mummy notwithstanding, museum remains were largely relegated behind the scenes to bone rooms. With largely unfounded concern, museum administrators, curators and other critics worried audiences would be disgusted when shown vivid details about human anatomy. Gradually, as medical illustrations became better and easier to reproduce in textbooks, the need for demonstrations with real “specimens” seemed to dissipate. First displayed at a World’s Fair in Chicago in 1933, see-through models of the human body became a favorite attraction at medical exhibits in years to come. Models replicated actual human body parts rather than displaying them in preserved form. 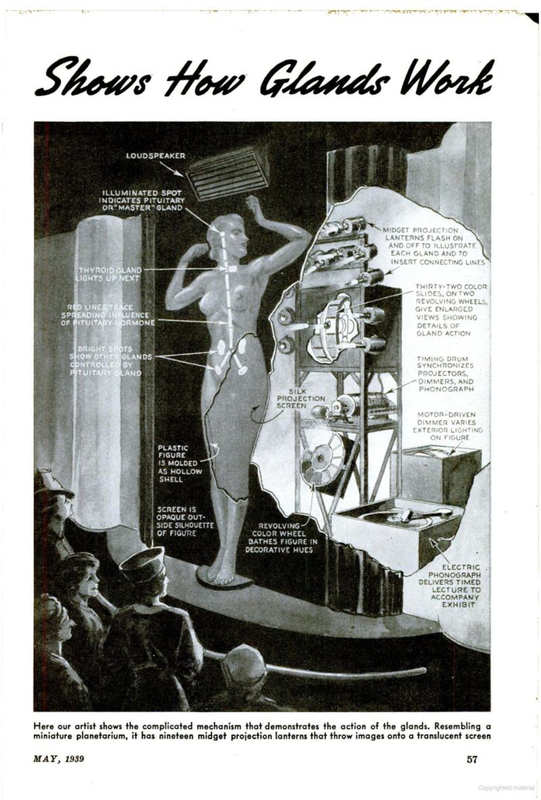 Exhibits were sometimes animated with light shows and synchronized lectures. Later, in the 1960s, new transparent models were created for popular education. Eventually, some of the many transparent medical models wound up in science museums. Although popular, it remains unclear how effective the models were in either teaching visitors or inspiring them to learn more about the human body. Over the years, methods for teaching anatomy shifted. Many medical museums even closed permanently. Those that could not dispose of collections by destroying them donated or sold them. Human body exhibits generally faded from public consciousness. But after decades of declining visitor numbers, something surprising started happening at one of the nation’s most important medical museums. 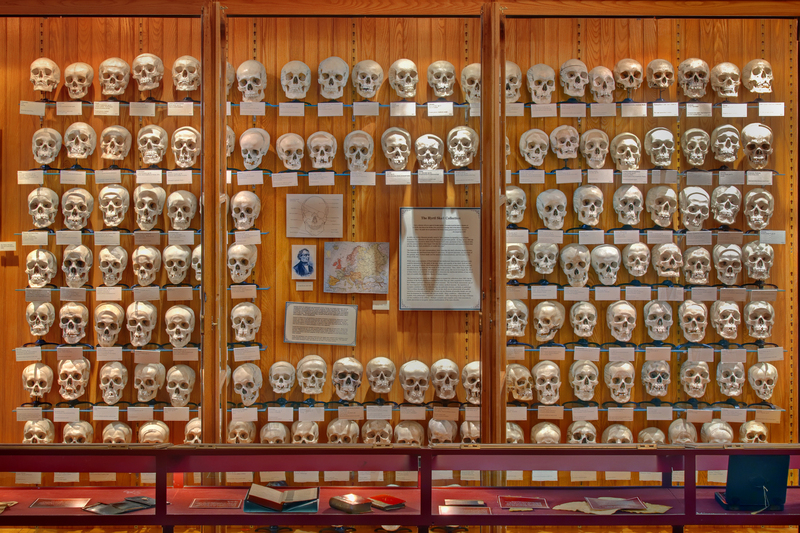 The Mütter Museum’s displays continued to draw heavily from its human remains collections even as similar institutions moved away from such exhibits. From the mid-1980s to 2007, the number of visitors entering the Mütter’s galleries grew from roughly 5,000 visitors per year to more than 60,000. Today, the museum is the most visited small museum in Philadelphia, hosting over 130,000 visitors annually. When Body Worlds began touring museums in the mid-1990s, it tapped into a curiosity in the U.S. that has probably always existed – a fascination with death and the human body. People are very often unsettled by seeing what were once living, breathing, human beings – people with emotions and families – turned into scientific specimens intended for public consumption. Despite whatever discomfort emerges, however, the curious appeal of medicalized body displays at public museums lingers, enough so to make them consistently appealing as fodder for popular exhibitions. The exhibits are partially successful in achieving that mission. In tension with the message about human fragility, though, is the desire to preserve them by preventing their natural decay through technology. With public schools cutting health programs in classrooms around the United States, it stands to reason people might seek this kind of body knowledge elsewhere. Models are never quite as uniquely appealing as actual flesh and bone. But while charged emotional responses have the potential to heighten curiosity, they can also inhibit learning. While museum administrators voiced concern that visitors would be horrified viewing actual human bodies on exhibit, the public has instead proven to have an almost insatiable thirst for seeing scientized dead. In the face of this popularity, museums must fully consider the special implications and problems with these exhibitions when choosing to display human bodies. One basic concern relates to the exact origins of these bodies. Criticisms elicited an official response from von Hagens. Major ethical differences exist between exhibitions including human remains where permission has been granted in advance by the deceased or through descendants and museum displays revealing bodies of individuals offered no choice in the matter. Spiritually sacred objects and the remains of past people present unique issues which must be dealt with sensitively and on an individual basis. Cultural and historical context is important. Consulting with living ancestors is critical. Exhibitors also need to do more to put these displays into greater historical context for visitors. Without it, visitors might mistake artfully posed cadavers as art pieces, which they most assuredly are not. These are all issues we will likely be grappling with for years to come. If past history is suggestive of future trends, visitors will continue to be drawn to these exhibits as long as the human body remains mysterious and alluring.